To win a war one country needs a huge quantity of tanks, planes and guns and a powerful industry to back it all up. It needs tons of resources and piles of money. But it also needs brave men. Men whose determination and bravery prevail on the battlefield in those decisive moments that change the course of war. One such was David Currie of the Canadian south Alberta Regiment. Major David V. Currie, V.C., South Alberta Regiment, Breda, Netherlands, 25 November 1944. 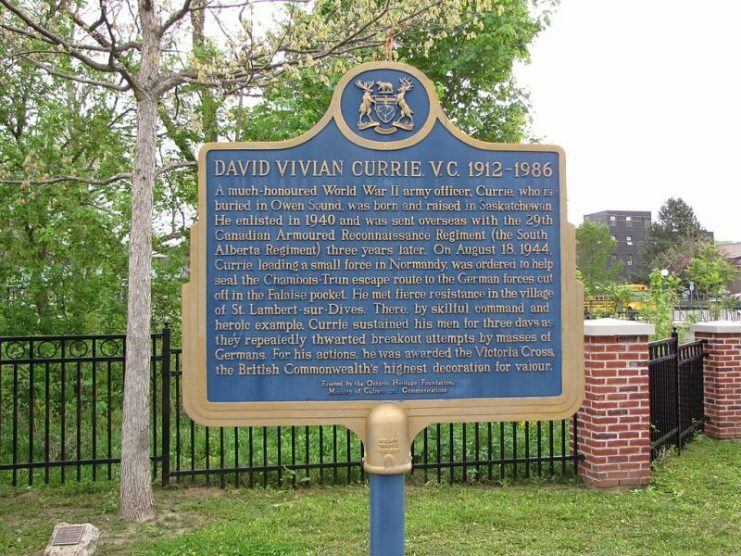 David Vivian Currie was just another Canadian fellow from the Saskatchewan province of Canada. Son of David Henry Currie, an engineer of the Canadian Pacific Railroad company, David was born in 1912 in the small town of Sutherland. When he was just a baby his parents moved to Moose Jaw, where David spent his childhood. It was there that he graduated from the Central Collegiate High School and later a local technical school to become a car mechanic. Everything in his life was pointing to a typical small-town-boy story, but David was a different type of kid. Whatever situation was brought upon him, he was determined to reach his goals and always did so in a thoughtful and above all calm manner. With the approach of the Second World War, David’s distinctive character led him to join the local militia in 1939. The following year he joined the South Alberta Regiment of the Regular Army. During his time with militia, David trained with World War I veterans, who knew a thing or two about bullets flying over one’s head. This proved to be a great experience for him, once he went to France. 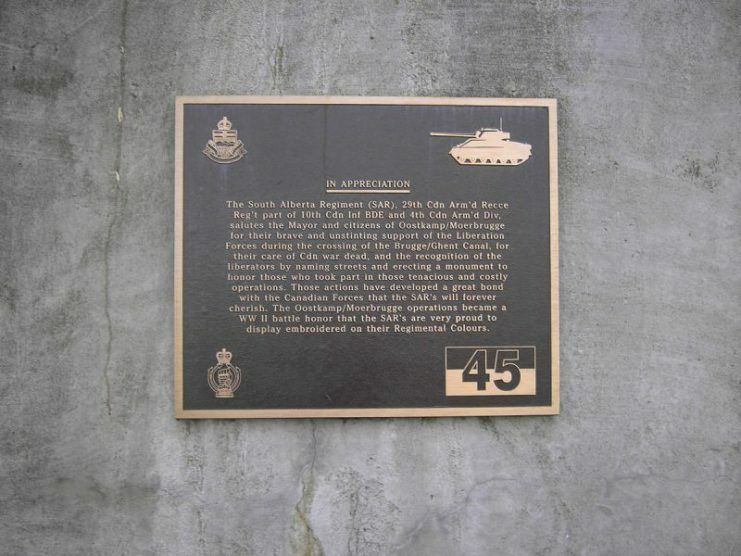 In 1941 the South Alberta Regiment became the 29th Armored Regiment of the 4th Armored Division. Having all qualities of a good officer and with mechanic skills that perfectly suited an armored unit, David was commissioned in the regiment as a Lieutenant. Very quickly he was promoted to Captain. In 1942 entire division was deployed to the United Kingdom, where they spent most of the time training and preparing to take their part in fighting against Nazis. Showing great command skills, David was put in charge of the C squadron and received the rank of Major in August 1943. At the same time next year, David Currie would be fighting the battle of his life. 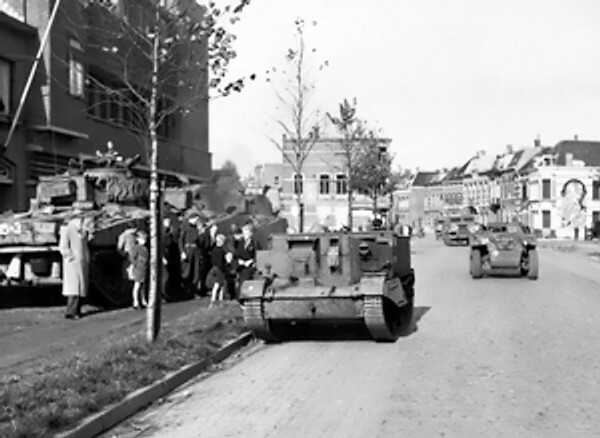 4th Canadian Division in Netherlands, 1944. Being an armored unit, David’s 29th Armored Regiment didn’t participate in the Normandy landings on June 6, 1944. It was only after seven weeks, on July 24, that the 29th Armored set foot on French soil. By that time Allied forces had experienced heavy German resistance and realized that the Battle of Normandy would take more time than they had anticipated. David and his fellows were called into action just when the American 1st and 3rd Army launched an offensive in Southern Normandy in order to encircle the German 7th Army and the 5th Panzer Army in positions south of Caen. Simultaneously, the British 2nd Army and Canadian 1st Army attacked from the north. Allied Sherman tanks carrying infantry wait for the order to advance at the start of Operation ‘Goodwood’ (Battle for Caen). Despite objections of all German commanders on the field, primarily field marshal von Kluge, Hitler rejected any possibility of withdrawal. He instead ordered his men to counterattack the enemy on all lines. 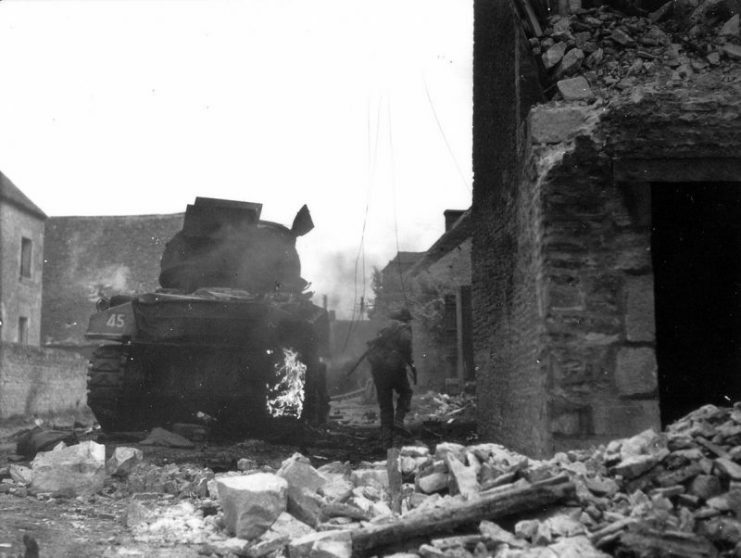 That situation allowed the Allies to completely encircle the Germans by closing the pocket at the town of Falaise. The role of Canadian troops was crucial in achieving this goal. 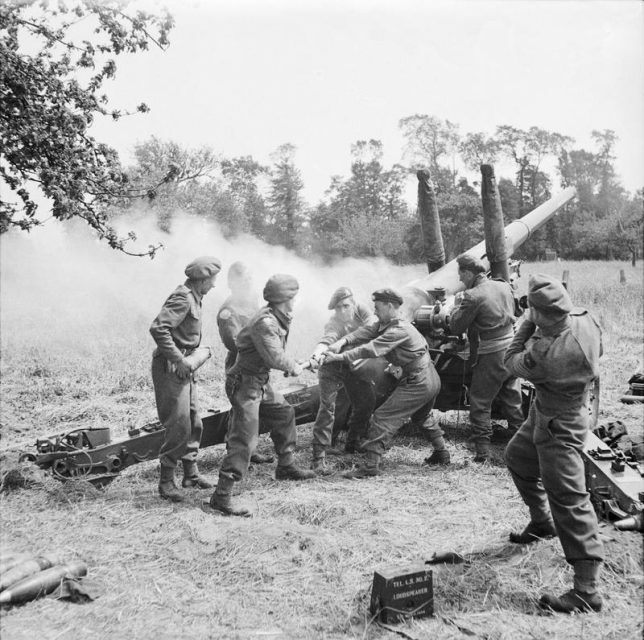 A British 4.5 inch gun being primed ready for firing by men of 211 Battery, 64th Medium Regiment, Royal Artillery near Tilly-sur-Seulles, during the holding operation before the push to Caen. 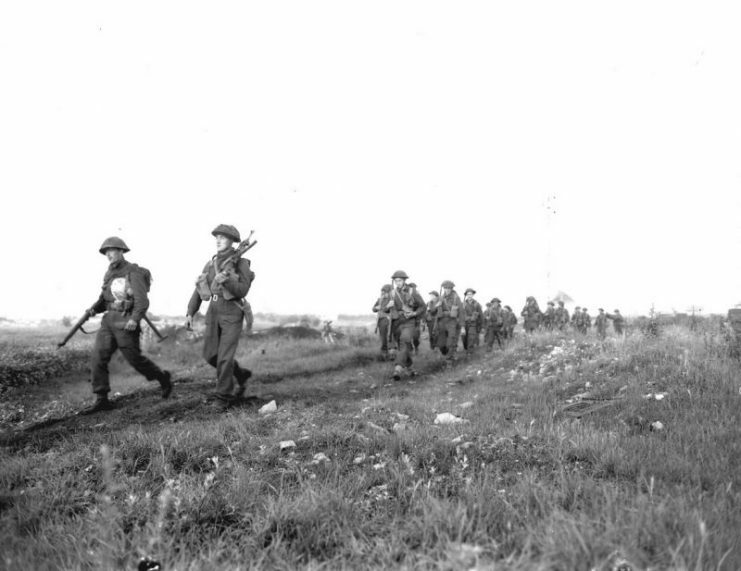 While American and British troops maintained pressure on Germans inside the gap, 2nd Canadian Corps was to start Operation Totalize in order to break the German defense north of Falaise. After suffering heavy casualties, four Canadian divisions eventually managed to break German lines and continue their rally toward Falaise. 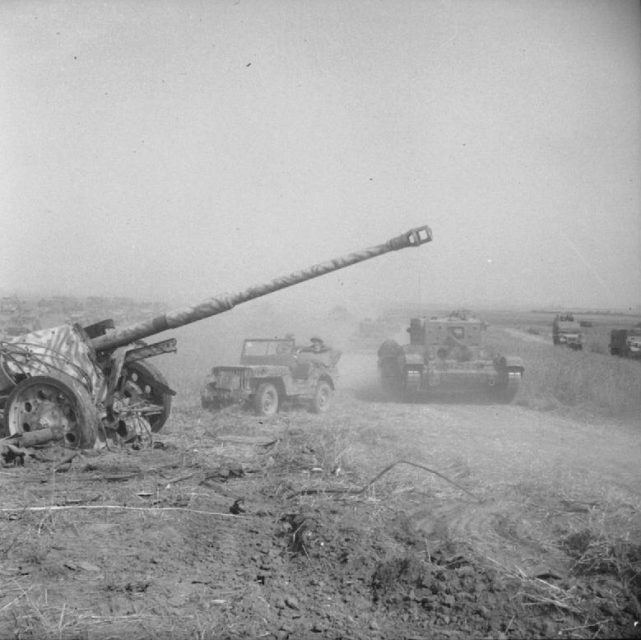 A Cromwell tank and jeep pass an abandoned German PAK 43/41 gun during Operation ‘Totalise’. 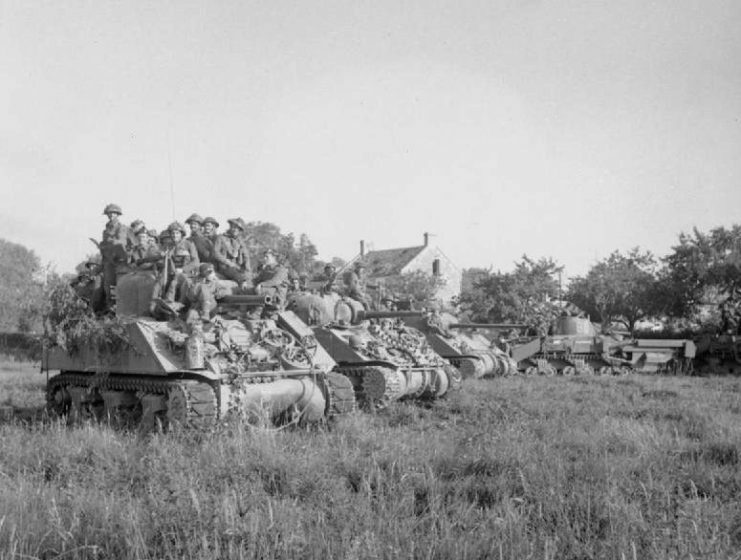 Currie’s squadron of M4 Sherman tanks, with the help of few self-propelled anti-tank guns and an attached company of Argyll and Sutherland Highlanders, covered the advance of Polish troops. As the gap was closing, Currie received the task of securing the village of St-Lambert-sur-Dives, the last route that Germans could have used for the retreat. Canadian troops searching German prisoners during the early stages of Operation Totalize. 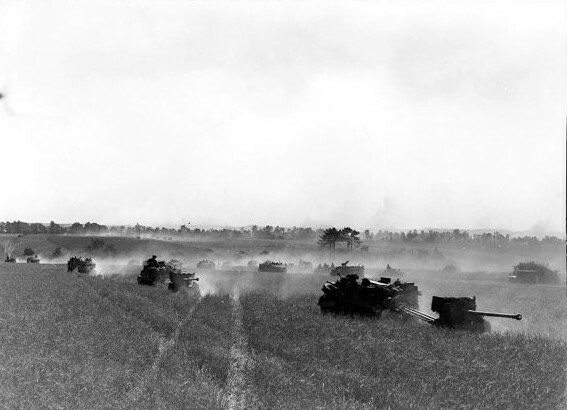 As Currie approached the village on August 18 with his squadron of 15 tanks, he found it occupied by Germans. From high ground, Currie could observe in the distance columns of German troops trying to escape the pocket. On that day, Currie and his men had less than two weeks of combat experience and were facing battle-hardened Germans, their powerful 88mm PaK-43 anti-tank guns, and Tiger tanks. Their attack on August 18 didn’t go well. As soon as they rushed toward the village, the leading tank was hit by PaK-43 gun, while the ambulance was mistakenly attacked by British planes. After he secured the wounded soldiers, Currie himself walked under the cover of night to the village to reconnoiter the situation. After he located the enemy tanks and guns, he went back to his position. 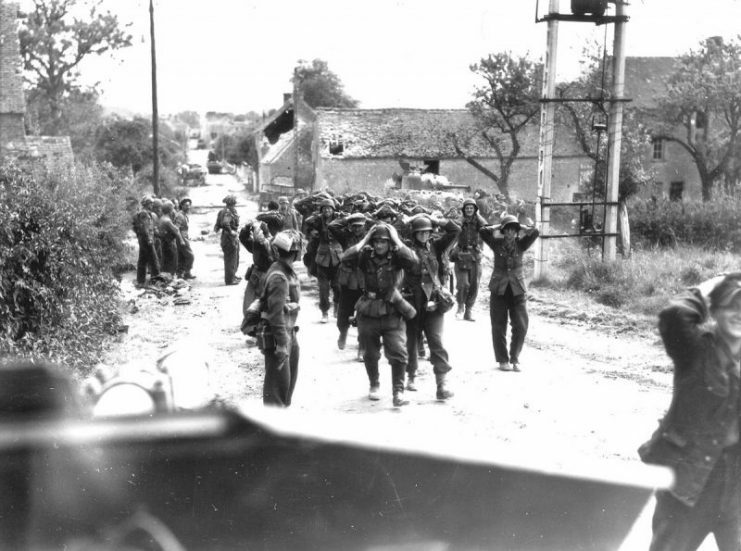 Canadian Forces move towards Falaise as part of Operation Tractable. Early in the morning of August 19, without previous artillery preparation, Currie ordered his unit to attack, now aware of enemy’s position inside the village. As soon as Currie’s task force entered the village, the Germans attacked their positions and would continue to do so until the dark. Despite suffering fire from German tanks and artillery, Currie and his men managed to occupy two-thirds of the village by noon. Knowing that they lacked the strength to push the Germans out altogether, Currie decided to dig in. Since his men were quite spread out, Currie also decided to shorten his line, and gave up part of the village. As he expected, the fighting continued throughout the night. The Germans were determined to fight off the Canadians. They knew that the route through the village was the last chance of escape for their encircled army. But Currie knew that as well, so he decided to take the battle upon himself and his men to the end. Moreover, he was so cool about it that all officers, NCOs and soldiers had no choice but to follow him. German forces surrendering in Saint-Lambert-sur-Dive. The next day German attacks followed one after another, but the Canadians stood firm. It was Currie’s cold and calculated behavior and on-the-edge handling of artillery that ruined every German attempt to overrun his defense, even though friendly shells were dropping just fifteen yards away from his men. Unlike a typical commander, David Currie was all over the place. At one moment he was coordinating the artillery barrage, then at another he was directing his own command-tank crew to knock out an enemy Tiger. Moments after, he was running from one position to another boosting the morale of his soldiers. 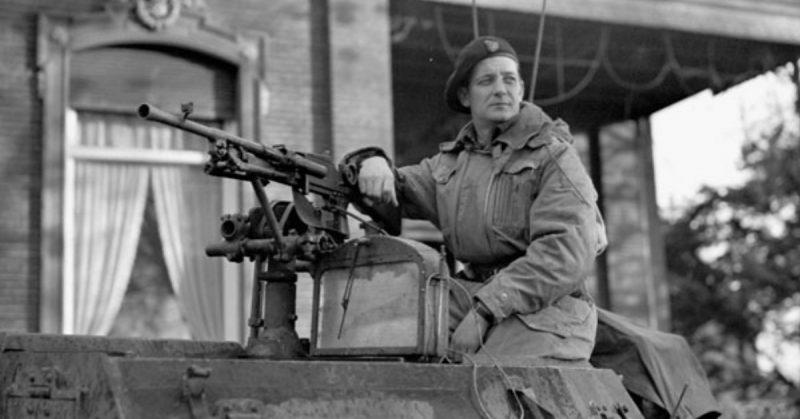 He even fought from the top of his tank, shooting enemy soldiers at close distance with his Lee-Enfield rifle. Currie’s gallantry served as an example to everyone. 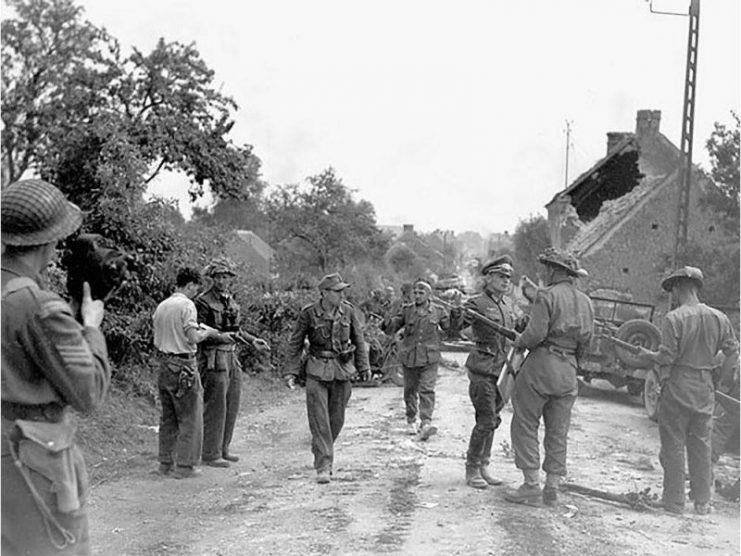 Currie (left of centre, holding a revolver) accepting the surrender of German troops at St. Lambert-sur-Dives, France, 19 August 1944. When a reinforcement of 40 men arrived to the village, Currie himself led them to their position and explained how important it was to hold that line. When those same soldiers retreated after one strong German attack, Currie went back to them and personally led them back to their positions. On the night of August 20, the Germans gathered all of what was left of their troops and decided to make one last attack. Once again, Currie’s skillful management broke their efforts. As soon as he noticed that something was happening on the other side, Currie ordered a heavy fire upon the enemy. The German attack was crushed before it even started. At that moment it seemed that the German resistance was over. 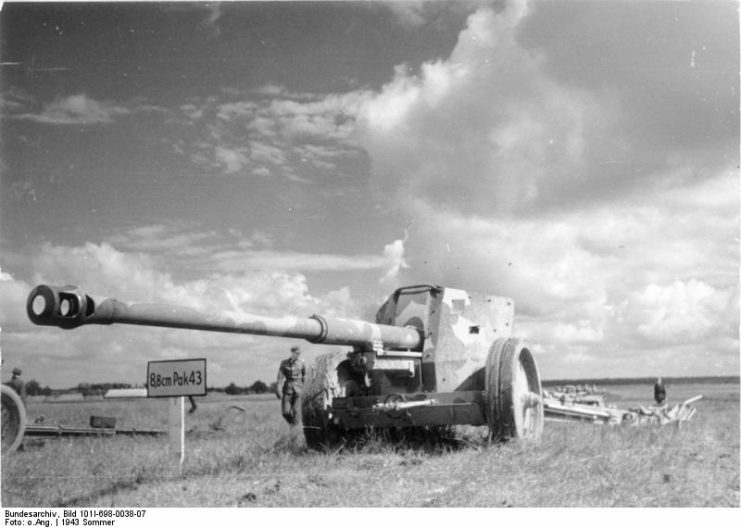 On the next morning, August 21, German soldiers begun to surrender in greater numbers. By the end of the day, with sporadic fighting, the whole village was captured. 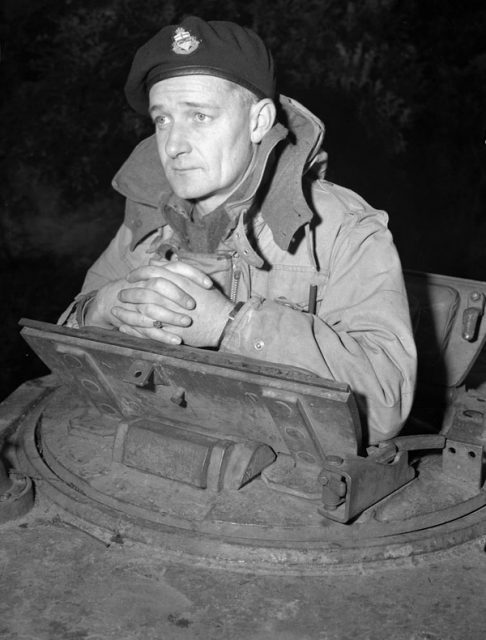 After four days of heavy battle, Currie and his brave men destroyed seven tanks, twelve PaK-43 guns, and 40 vehicles. 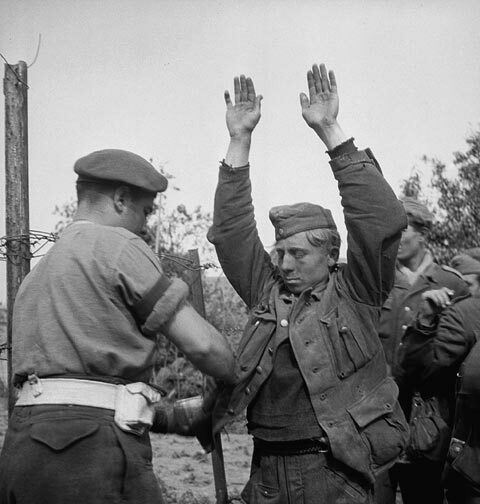 Around 300 Germans were killed, while 2,100 were captured. The St-Lambert-sur-Dives village was taken and the Falaise Gap was closed, leaving 50,000 German soldiers in a trap with no way out. The battle of Normandy was over. During these few days, David Currie had had only one hour of sleep. After everything was over, he fell asleep on his feet. Even though he became a hero, David continued his loyal service by fighting the Germans in Netherlands and Northern Germany. On November 30, 1944 he was awarded the Victoria Cross for the courage and devotion he showed during the prolonged period of heavy fighting in the village of St-Lambert-sur-Dives. In December 1944, Currie went back to Canada in order to promote the war effort. After the war was over, he returned home and continued to live his life completely unaltered by the fame he earned in Normandy in August 1944.